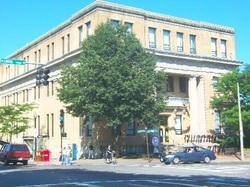 The Roslindale Community Center is located in Roslindale Square Village at the corner of Washington Street and Cummins Highway. Programming begins in the morning hours and continues through the building's closure in the evening as posted. Among the programs are pre-kindergarten, after school day care, summer day programming (summer camp), kids and adult sports and fitness, and many more items too numerous to list here. There are many opportunities available for willing volunteers. Are you a student? Person with free time? Retired person? Community activist? There are many ways to volunteer and many programs to choose from. All volunteers are required to pass a criminal background check as required by law (CORI / SORI). This helps assure the safety and well being of all parties. The community center helps with this process. Person's volunteering in the Early Education and Care licensed programs will also have a second background check conducted by the Commonwealth as required by the Dept. of EEC. Can you help with the kids? Offer instruction in some programming? Homework help? Read a story? Spend some time at the reception desk or in the computer lab? Coach sports? There are many possibilities. Students!! Does your school require participation in community service as a condition of graduating? Does your church require participation in community service for spiritual progression? We may be able to assist. If this sounds interesting, please do stop in to inquire and pick up a volunteer application form. We would love to speak to you.